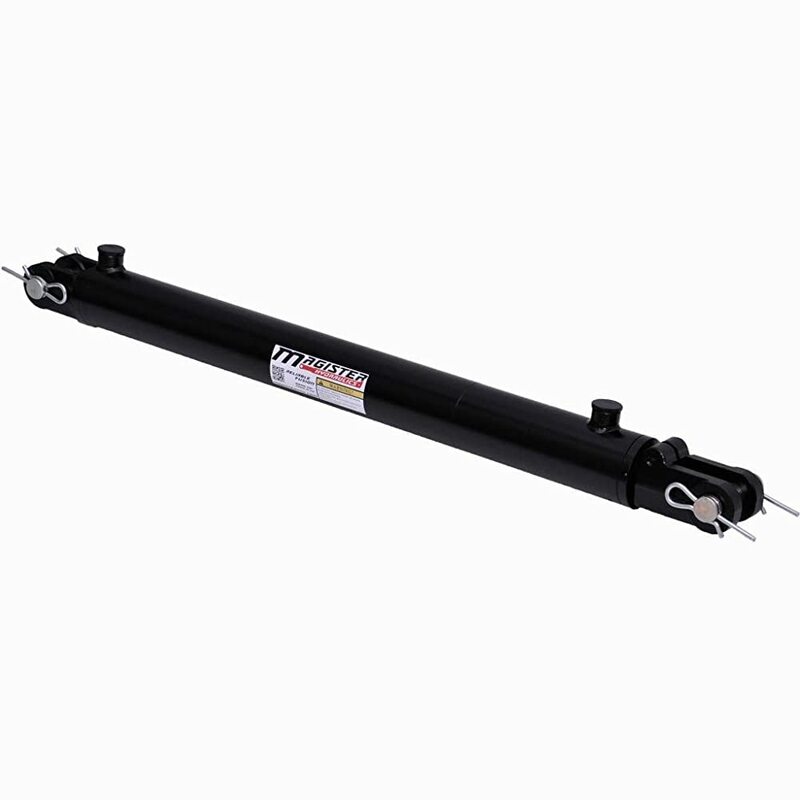 Hydraulic Cylinder Reviews: Top 10 Listed in April 2019! Hydraulic Cylinder -Buyers Guide & The Best Choices! Any heavy application condition requires the use of a hydraulic cylinder. These are linear force application tools that are sued to pull or push loads. Hydraulic cylinders require the use of a pump that matches or provides the power to push and pull the cylinder. Hydraulic cylinders are basically tubes with a piston and a rod, and two chambers, one filled with hydraulic liquid and that the second with air. The pump produces the necessary air pressure that forces the piston to push or pull the rod, so an appropriate pump is needed for maximum efficiency of operation. When purchasing a hydraulic cylinder, you must make sure that the shafts and rod clevis are both as powerful as the force being applied, this means, that if the cylinder is designed for an 8-ton force, you want the shaft and clevis to be able to support at least 8 tons, if not more. This is why I created a review of the ten best hydraulic cylinders on the market today, where the KPI’s were based on material strength, reliability, durability, and price. 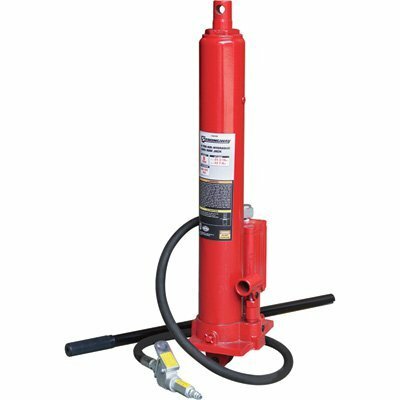 The Strongway™ 8-ton capacity hydraulic jack is made of dense high-grade steel and is made to ASME PALD 2009 standards. This tool is a perfect fit, and a must-have for all hydraulic hoists and will convert it into a fast and efficient lifting machine. This model is designed to fit onto all shop cranes and is finished with a lead-free bake enamel coating that provides extra protection against knocks and scratches, as well as corrosion. The ram piston has a 19” stroke and will handle all loads up to 8 metric tons. Maximum Lift Height 42 in. Stroke length (in.) 17-1/4 in. The MAXIM TC 2500 PSI tie-rod cylinder is an agricultural hydraulic cylinder that was redesigned for double-acting industrial and agricultural applications. This model comes with impressive features, including a ductile iron ASTM A536 65-45-12 piston and a grade 8, high tensile zinc-plated piston lock nut. The gland is made of ASTM A536 65-45-12 iron, and the tube is a high tensile cold drawn steel with an O-ring seal. The Maxim TC 2500 Rod is made of a high tensile ground, and polished chrome plated ASTM 5140 steel, and the rod seal is a standard B lip design PolyPak (Polyurethane U-cup with nitrite O-ring expander), with a Polyurethane wiper. Some more great features include the iron ASTM A536 65-45-12 ductile iron end mounts, the grade 8.8 clevis clamp bolt with grade 8 clevis clamp nut. The pin and pin clip is made of a high tensile zinc-plated steel, and the piston comes with an internal O-ring and external Hallite 755 seal. The new Hydroworks Double Performing 3” Bore 24” Stroke Tie Rod Hydraulic cylinder is made of rugged ductile iron and comes with polyurethane u-cup double lip supplies certain seal. The piston rod is made of precision steel and is chrome plated and polished. Each cylinder goes through a 100hr salt spray test. 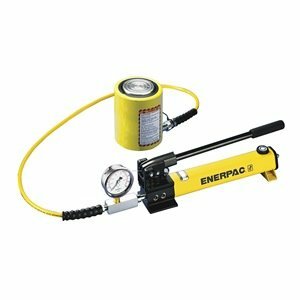 The Enerpac Pump and Cylinder Set is a Low Height Cylinder that delivers a 20 Ton capacity. This cylinder provides a 1.75” stroke and when retracted is 3.88” in height. This is a hand pump type unit and actively works up to 10,000 PSI maximum pressure. The maximum handle effort is gauged at 93 lbs. This is a composite material pump, which means its made of various grades of ductile iron, steel and synthetic parts including a 6 Foot Thermoplastic Hose that provides extra reach. You also get a calibrated gauge and gauge adapter for proper control. 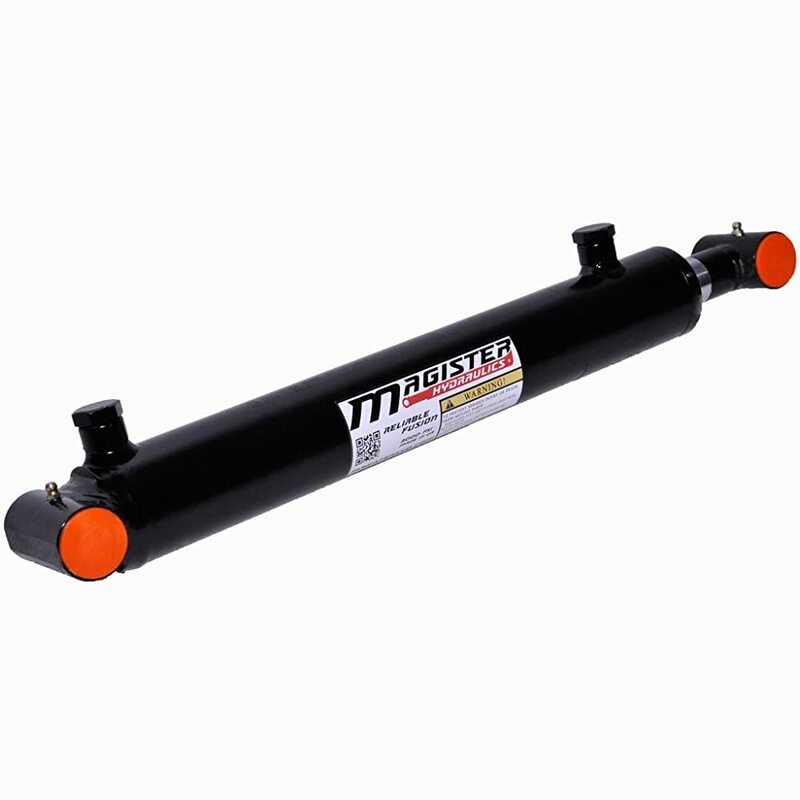 The Magister Hydraulics Welded Hydraulic Cylinder Cross Tube Style is a 3500-psi tube that is made of long lasting and reliable materials. The cylinders undergo a rigorous pre-testing of up to 150% pressure and are all manufactured in accordance to ISO 9001. The tube is made of a high tensile cold drawn steel, and the rod undergoes grinding and polishing, and then chrome plating for extra efficiency. There is a precision threaded gland that comes with wear rings to assure constant pressure maintenance, and the piston is high tensile steel for superior performance. The base ends are all welded and tested for load bearing functionality. This model uses U-cup polyurethane rod seals with inner O-ring, and POM-C wears rings with polyurethane wiper. 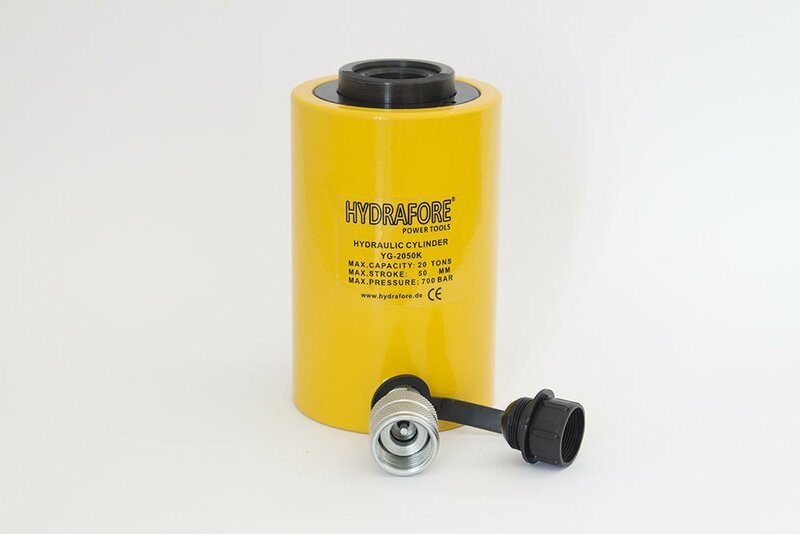 The Hydrofore is an all steel component part that comes with an HH-2/M coupling sleeve, a cylinder return spring, and a 3/8” NPT connection thread. This is a single acting vertical cylinder that provides a smooth and efficient working base for all applications. This cylinder works best with the Hydrofore B-700C hand pump. 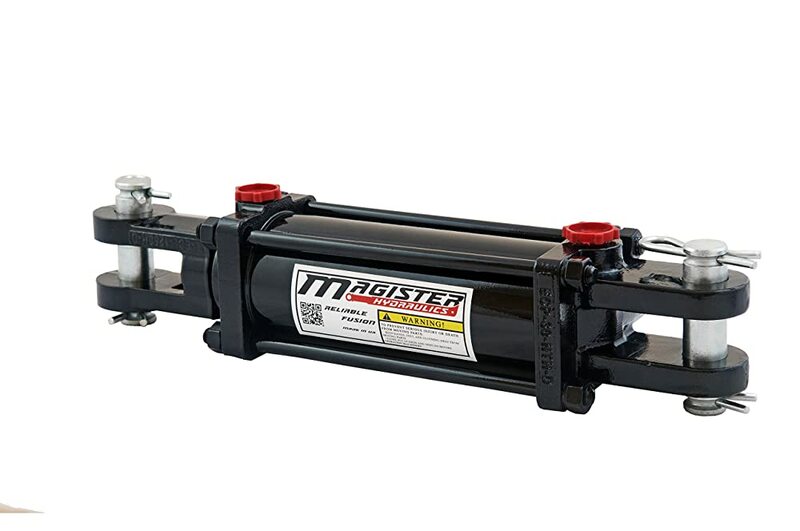 The Magister Hydraulics Hydraulic Cylinder Clevis 3500 PSI is a masterpiece of power that delivers 3,500 PSI with ease. This ia s multiple application cylinder for use in just about any industry. This part is made with ISO 9001:2008 compliance. The tube is a honed cold drawn steel, and the rod is made of high tensile steel that is ground, polished and chrome plated. The gland is precision threaded and comes with wear rings, and the piston is a high tensile steel. The base and rod ends are made of forged steel with clevis end mount. This model comes with the MH five components compact seals and the rod seals are standard polyurethane and come with an inner O-ring, POM-C wear rings with rod wiper. This is a general category item, and has 57 specific application sizes and strengths to choose from. There are 57 products with different specifications that can be ordered, you may choose the specific item for your requirements on the product page. 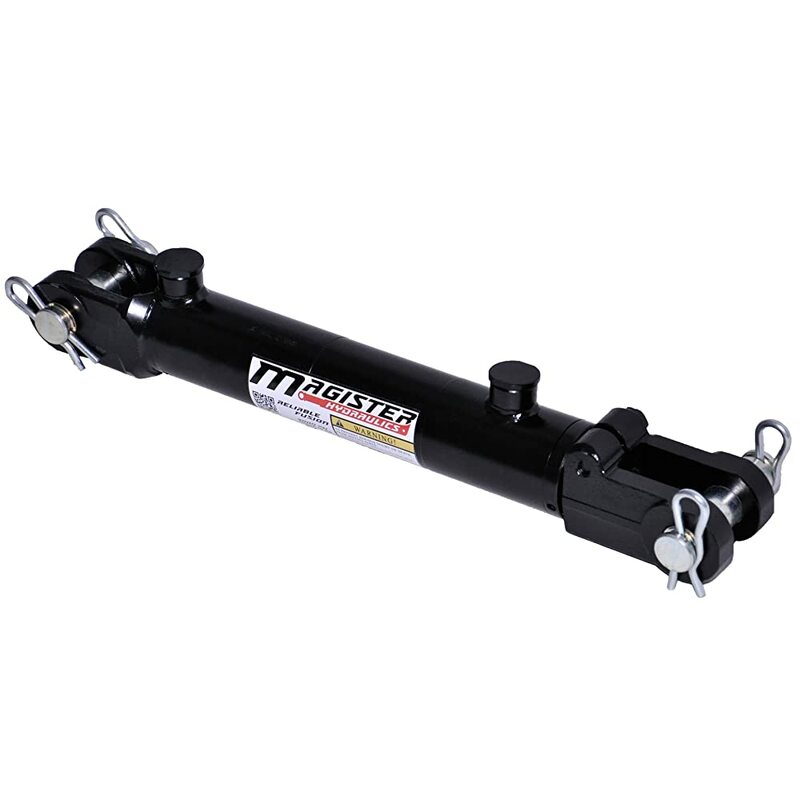 The Magister Hydraulics Hydraulic Cylinder Clevis 3500 PSI 3” x 24” is part of the 3,500 PSI clevis category that is designed for multiple applications in many industrial environments. The Hydroworks T25350810-ASAE Double Acting 3.5” bore 24” Stroke Tie Rod Hydraulic Cylinder operates at up to 2500 PSI, ASAE is a comprehensive industrial and agricultural solution provider. This part is made of C1045 high tensile steel and comes with polyurethane u-cup double lip seals and 90 durometer polyurethane “o” rings. The casement is made of C1045 High tensile steel, and comes with a zinc plated steel plug. 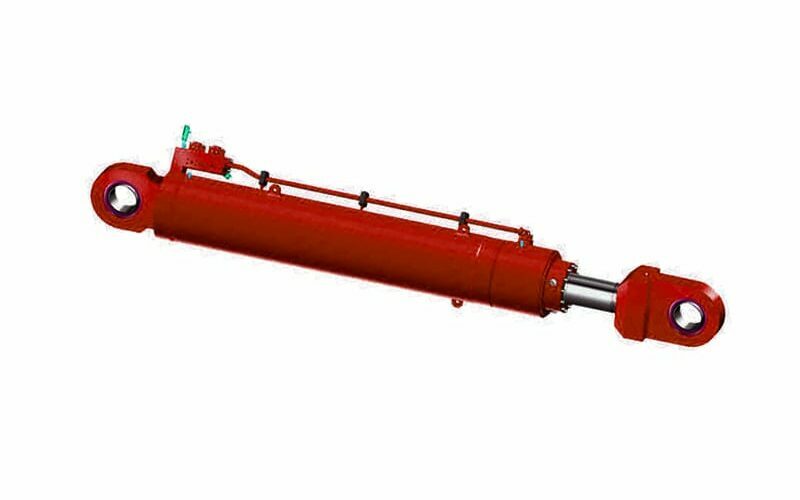 The Magister Hydraulics double acting tie rod hydraulic cylinder is a multiple application cylinder for use in industry, agriculture and retail. This item comes in 47 optional configurations, and is made to meet ISO 9001:2008 compliance. The tube is a honed cold drawn steel, and the rod is made of high tensile steel that is ground, polished and chrome plated. The gland is precision threaded and comes with wear rings, and the piston is a high tensile steel. As with all MH products, the base and rod ends are made of forged steel with clevis end mount. This model comes with the MH five components compact seals and the rod seals are standard polyurethane and come with an inner O-ring, POM-C wear rings with rod wiper. This is a general category item, and has 47 specific application sizes and strengths to choose from. There are 47 options for this device, by entering the product page you can choose which one supports your application requirements.